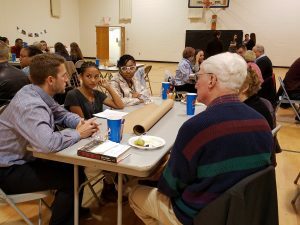 On November 9, community members came together to discuss Greater Carlisle as a welcoming community at the YWCA in Carlisle. The evening began with an icebreak er led by Dickinson College’s Vice President for Institution Effectiveness and Inclusivity, Brenda Bretz. 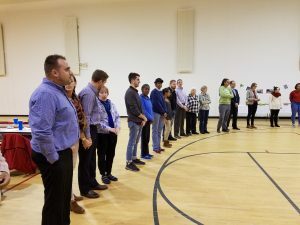 Participants stood in a circle and were asked to step forward when a questions applied to them. Questions centered around their experiences, from whether they paid for college or ever never experienced homelessness or food insecurity. 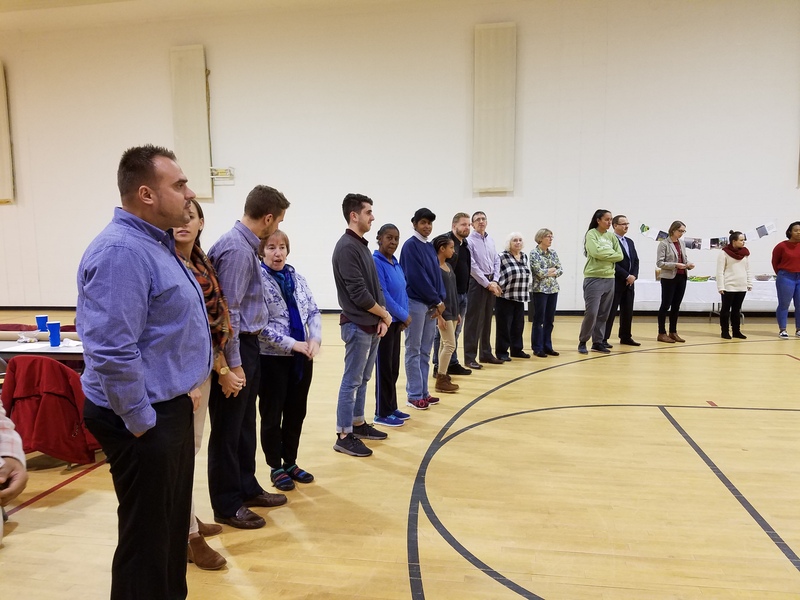 This exercise broke down preconceived barriers and helped everyone feel more comfortable with the conversations taking place that evening. For nearly an hour people discussed Greater Carlisle as a welcoming community, and came up with suggestions on how we can make our community more open. Suggestions including more collaboration with existing organizations and faith groups in the region, exploring media representation of our community, and focusing on education among young people to begin changing narratives. This conversation is the first in a series thanks to a $1,000 mini-grant from the Pennsylvania Humanities Council. Additional converstations will take place in the new year and focus on Greater Carlisle as a more inclusive and welcoming community. Community members, former congregants and descendants of congregants gathered at Mt. Tabor AME Zion Church in Mount Holly Springs on October 23 to celebrate the c hurch’s entry onto the Cumberland County Historic Register. 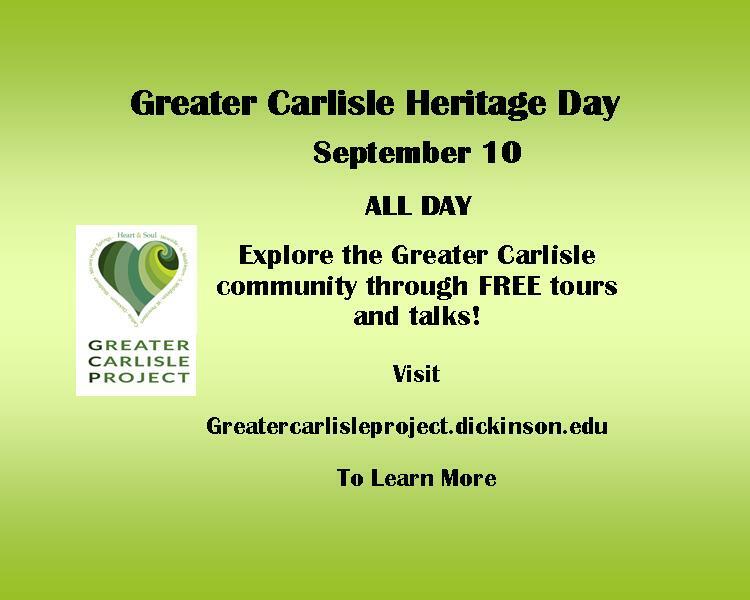 Since May 2016, the Greater Carlisle Community has been working with Greater Carlisle Heart & Soul to preserve and protect the history of this unique building. The Heart & Soul Project collected a story from Mt. Holly residents Harriet and Edna Gumby, who told us of their personal ties to the church and their desires to see the cemetery maintained and the African American community’s history preserved. Founded in the 1870’s, Mt. 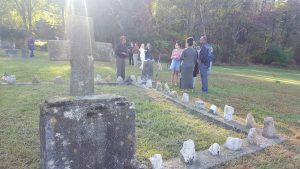 Tabor served the African American community until the early 1970’s when lack of employment forced many to leave the area and the congregation dwindled. The church was built by Elias Parker, grandfather to Harriet and Edna. He was a United States Colored Troop during the Civil War and a former enslaved person from Maryland. After the war he settled in Mt. Holly, married and raised his family. As a mason and carpenter he built Mt Tabor church for the African American community residing there. The church served as a community center for 100 years before shutting its doors sometime before 1973, but the memory of the past lingered with all the contents still perfectly intact, right down to fans and hymnals from the final service still laying in the pews. From the log cabin structure to the piano and pews inside, the church is an amazing and unique piece of Cumberland County history. 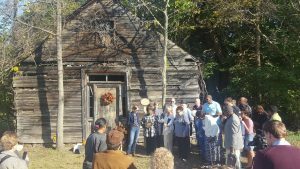 Over two years family and community members rallied to save this important piece of history. The contents inside were removed and placed into storage, volunteers organized clean-up days and cleared trash, brush, glass, and poison ivy from the around the church. In the cemetery, Home Depot generously donated shrubs, soil and mulch so volunteers could mark the boundaries of the property. The Mount Holly Paper Company also donated staff time and use of their scanner to produce a complete 3D scan of the property. 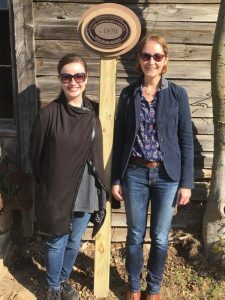 In June 2017, Dorothy Trigg, a master’s student in the Applied History program at Shippensburg University, interned for Greater Carlisle Heart & Soul and Cumberland County Historical Society and completed the historic register application for the churc h. With the success of this application Mt. Tabor Church & Cemetery is now listed on the County’s Historic Register and its history will be preserved for future generations. Thank you to everyone who joined us on Sunday, and thank you to everyone who has contributed to this wonderful project. Greater Carlisle Project looks forward to continuing its work with the community. On July 26, Greater Carlisle Heart & Soul held its first community summit at New Life Community Church. The night began with a dinner provided by local nonprofit, Hope Station. We value the rural and natural landscape that give us farmland, farmer’s markets and local food. 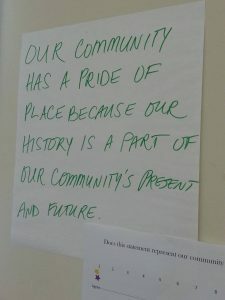 Our community has a pride of place because our history is a part of our community’s present and future. We love our publicly accessible lakes, streams, parks and trails that allow us to engage in outdoor recreation and provide wildlife habitat and great scenery. We love and value the diverse mix of independent restaurants and retail in a walkable, bikeable community with employment opportunities and access to major transportation and big cities. We fear losing this way of life. 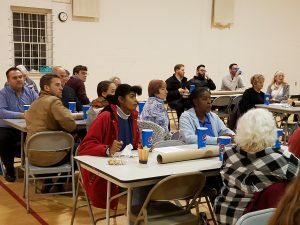 We value a community of people who are attentive, helpful, friendly and welcoming; a place that is culturally diverse yet has a small town feel; and an atmosphere of engagement and connectivity. 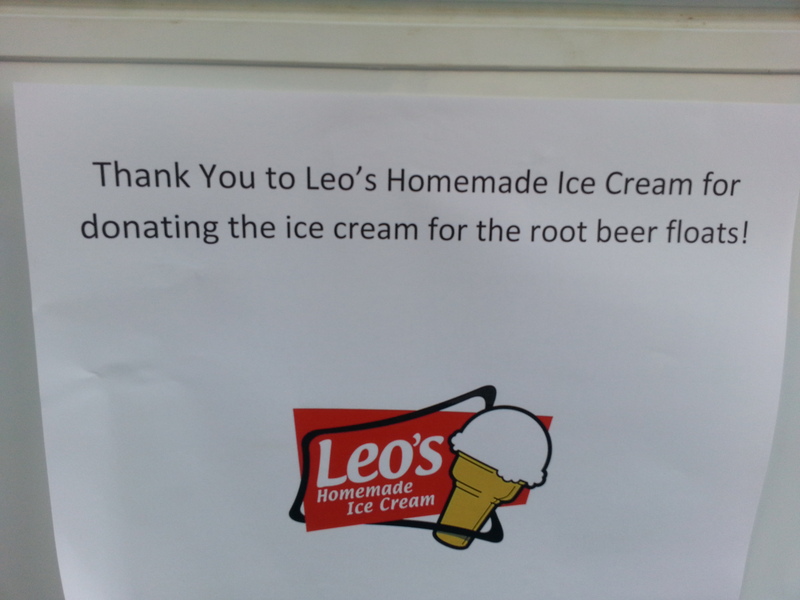 Because it builds relationships and strengthens ties to the community. We value having a wide range of educational opportunities for all ages, especially public schools, libraries and high education. We’re happy to live in a community that provides a wide array of health (not help) and human services for people in need. We worry about lack of low income housing, drug abuse and shortfalls in first responders. We in Carlisle value out small town feel with the people who care for each other, the safety and security and all the many amenities and its historic charm. We value the people of Carlisle and how we care for each other. We value the aesthetics of Carlisle with its beautiful churches, historic sites, front porch decorations, gaslights and its wonderful downtown shops and amenities. 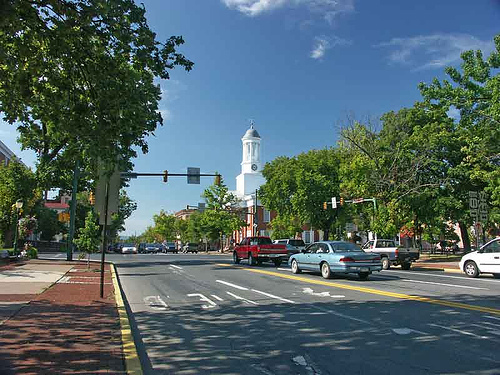 We value the small town “feel” of Carlisle with its people, safety and the amenities. The community statements are taken exclusively from the 800+ stories collected by Heart & Soul from Feb. 2016 to June 2017. The statements are not necessarily the reality of our community but rather the ideal community we would like to live in, and over the next few months Heart & Soul will share these statements will the Greater Carlisle community to better understand how we feel about our community and the action we can take to make these statements a reality. 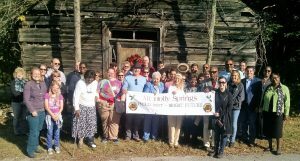 In Spring 2016, Greater Carlisle Heart & Soul Project collected a story from Harriet Gumby of Mount Holly Springs. Her family’s deep roots in Mount Holly inspired the community to take action to ensure the memory of Mt Tabor AME Zion church and cemetery is not lost to the community. The church was built by Harriet’s grandfather, Elias Parker, for the African American community in the 1870’s. Parker was a former enslaved person and member of the United States Colored Troop in the Civil War. The little log cabin church he built served the African American community until 1970 when the dwindling congregation shut its doors. The story of Mt Tabor left the memories of many people in Mount Holly Springs, but it stayed with the Gumby family as it connected them to their heritage. 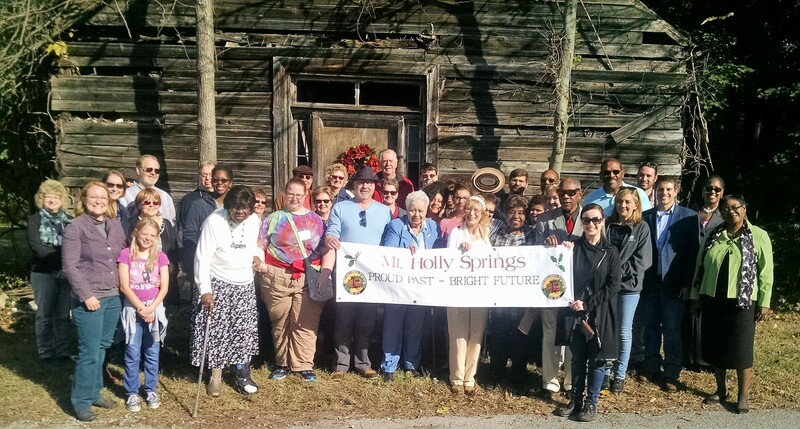 When Harriet shared her story of growing up in Mount Holly Springs, and specifically her desire to save the memory of the little church on the mountain, the community rallied around her and this forgotten piece of Cumberland County history. Throughout 2016 volunteers came forward to offer help – Mount Holly Springs Specialty Paper donated 3-D scans of the church and cemetery; the United Way’s Day of Caring organized volunteers from Ahold to clear out the items in the church and plant shrubs in the cemetery; and members of the community offering manual and financial support towards the project. Most importantly, Harriet’s story opened up a new understanding of family ties and history to the Ward and Smith families. 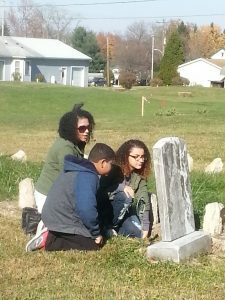 Having undertaken extensive search into their African American ancestors, the family believed they had gone as far as they could, but the church opened a new avenue in which they found the grave of their great-grandfather, a US Colored Troop in the 25th infantry. This is the first piece of tangible history the family has found on their ancestors and it is a piece of history they can pass on to the next generation. This is the power of storytelling. By gathering stories on what we value and fear losing communities can come together in the most unlikely ways. This is what Greater Carlisle Heart & Soul works to achieve. Last year we collected over 600 stories from individuals living, working and playing in Greater Carlisle, and we learned that our community values outdoor spaces, the region’s landscape, history and heritage and a vibrant downtown. In 2017, we are using these stories to take action. We are continuing to work with the Mt Tabor project to ensure Harriet’s wishes are fulfilled. 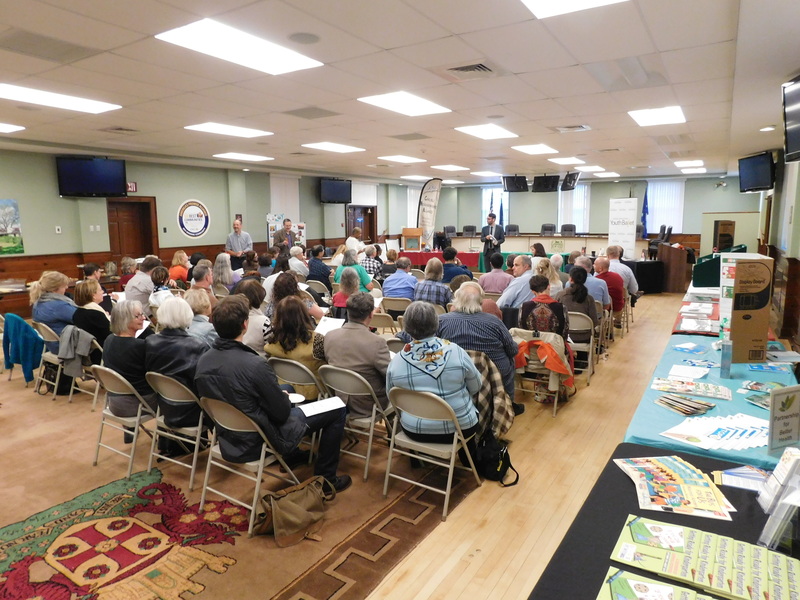 We are partnering with regional and state-wide organizations to discuss the community’s concerns for preservation of our outdoor spaces, landscape and history. Lastly, we are working to promote your values and heritage through hands-on activities such as a living history block party, walking tours and talk and building off of 2016’s successful heritage festival a week of heritage events in September. We are working to ensure our community’s values are celebrated and that your culture does not become another piece of lost history. To achieve these goals Greater Carlisle Heart & Soul is excited participate in the Partnership for Better Heath’s Match Madness campaign during the month of March. The Partnership for Better Health is offering a $50,000 stretch fund to participating organization, and this will be used to match individual donations to Greater Carlisle Heart & Soul. We are asking for your support. No matter what your giving level is, every gift, large or small, will make a difference to Heart & Soul. 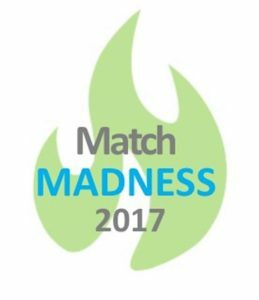 Please visit – Match Madness Contribution to Greater Carlisle Heart & Soul – to donate to Greater Carlisle Heart & Soul. To hear about Mt Tabor Church and Cemetery and the community members involved in the project watch this video produced by the Orton Family Foundation. 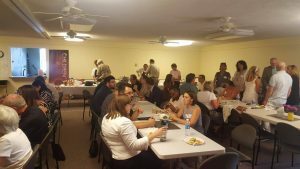 With support and funding from the Pennsylvania Humanities Council, Orton Family Foundation and South Mountain Partnership, Greater Carlisle Project implemented its Heart & Soul initiative in 2016. 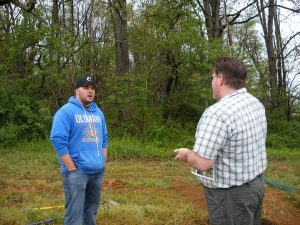 Lindenwood Park Tree Planting, Dickinson Twp. Overall, the Project collected over 600 written, drawn, audio and video interviews from individuals living, working and playing in Greater Carlisle. In the latter half of 2016, Heart & Soul began to share and take action with these stories. In Mount Holly Springs a story has led to a community-driven preservation project where we are working to actively preserve the history and heritage of an c.1870 African Methodist Episcopal church and cemetery. We also took the special places and location told through the stories and held the first annual Heritage Day on September 10. On this day three locations were highlighted-Mount Holly Marsh Preserve, Allen Road stretch of the Cumberland Valley Rails to Trails, and AME Zion Church in Mount Holly Springs. We also created a Greater Carlisle Underground Railroad and Civil War trail. For 2017, our aim is to expand our story collecting efforts in Greater Carlisle. 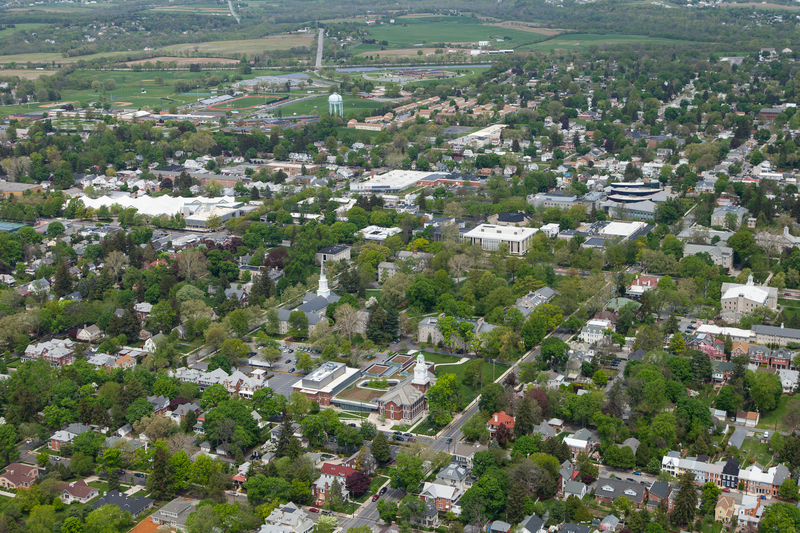 We have learned that people value the culture of Greater Carlisle – Landscape, downtown businesses, small town feel, history, parks and outdoor spaces. 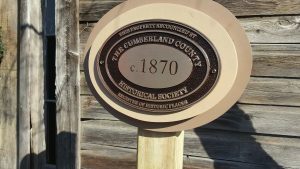 From this understanding we will share out what we’ve learned through a series of Heritage Days in conjunction with Cumberland County Historical Society. We will dig deeper into your stories to uncover more of what you value. We will also begin to share what you value with community members and local officials to work towards taking action and preserving what is important to the Greater Carlisle Community. For one day we will highlight what the community told us through their stories. 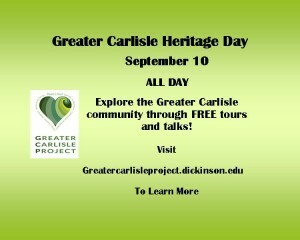 Locations across the Greater Carlisle Area will be open to the public for one day. Stories collected throughout the year will be highlighted to show what’s important to our community and how we can protect the future. There will be organized talks and tours on history and preservation, as well as self-guided walking and cycling tours. Come out and learn what our community values and discuss ways we can protect what’s important to us. Tours on the day will be a mixture of self-guided and organized tours/talks. If you would like to attend an organized you must sign up in advance and on the day bring along a signed liability waiver. Go to the Heart & Soul Events page for more information. 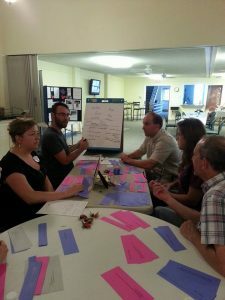 In January 2016, The Greater Carlisle Project (GCP) received a one-year, $50,000 civic engagement grant from the Pennsylvania Humanities Council (PHC) to implement a resident-driven approach to community planning and development. Additionally, the Greater Carlisle Heart and Soul Project was supported for $10,000 from the South Mountain Partnership. Following the Heart & Soul framework of the Orton Family Foundation, members of the Greater Carlisle Project, with the leadership of a new Project Director Lindsay Varner, will engage people from all segments of our community in telling, listening to and sharing stories about our community. Through the storytelling process, community members will come to know the “heart and soul” of the community – what we value, what matters most, how we relate to each other and to our landscape, and what we want for our future. The team will recognize and keep in mind that community members will answer these questions in diverse ways, and that hard work and an open and inclusive process is necessary to find common ground for actions that benefit us all. We will use the co-created knowledge of our place and ourselves to bring together residents, community organizations, businesses and public agencies in common cause for strengthening the Greater Carlisle community. Project information also available from the PHC Project website for the Greater Carlisle Heart and Soul.